10" Overall with a 5.5" sharpened stainless blade, full tang with large hardwood handles for easy grip, design for heavy duty skinning and hunting use. Complete with leather belt sheath, handmade item. 9.5" Overall with a 4.5" sharpened stainless blade with titanium coating. 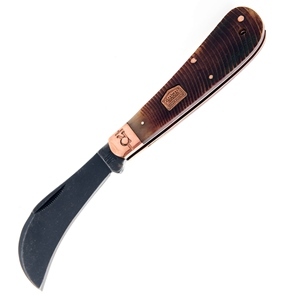 Full tang with composite handle grips. Nylon belt sheath included. 8.13" overall. 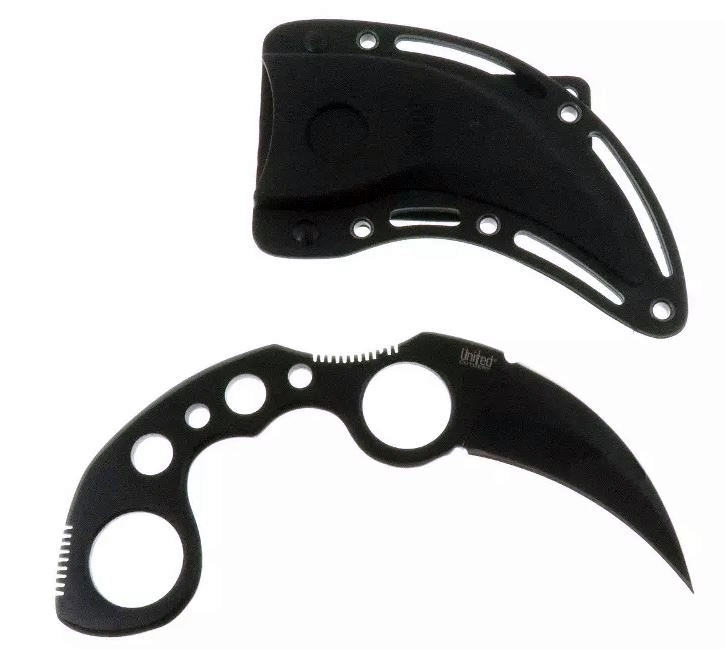 4.25" satin finish, sharpened stainless karambit blade. Black smooth wood handle. Finger ring. Full, extended tang. 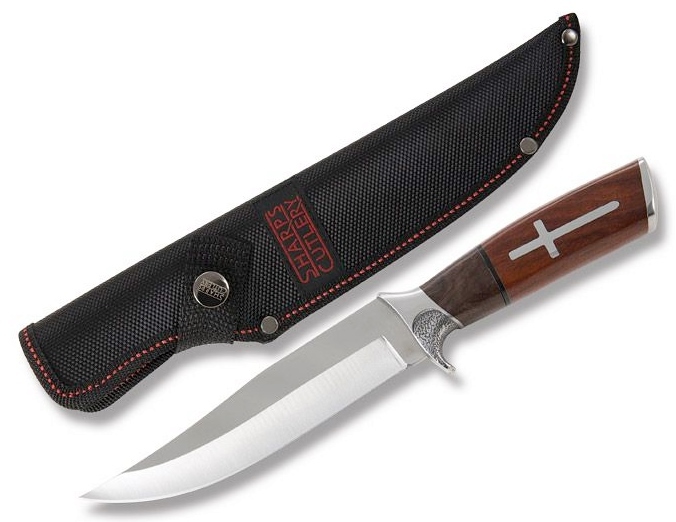 7.25" Overall with a 3.4" sharpened stainless blade with red/black finish. Black ABS handle, stainless finder ring, hard ABS click sheath with neck cord. 11" Overall with a sharpened, stainless blade. Wooden handle and brass fittigs, complete with good quality leather belt sheath, perfect for pirate themed shows etc, (edge can be filed off for safety). 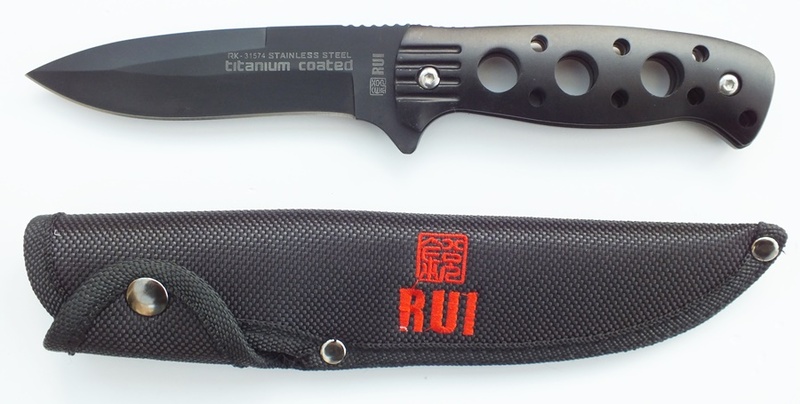 Features: 3Cr13 Sharpened Stainless Steel Blade. Two Tone Brown Wood Handle. Stainless Steel Guard with Partial Texturing on Guard. Stainless Steel End Cap and Inlaid Crosses. Black Spacer. Measures: 6-1/2” Drop Point Blade. 3/16" Blade Thickness. 12” Overall. 14.88oz. 6.5" Overall with a 3.31" sharpened AUS-6 stainless steel blade, one piece construction in black finish. Includes hard ABS case with belt clip, great quality. Blackwash 440a Stainless Steel Blades. Sawcut Amber Bone Handle. Half Stops. Copper Pins, Liners, and "Always Ready" Shield. Ringed and Pinched Slant R Copper Bolsters. Lanyard Hole. Measurements: Blade Thicknesses: 1/16". 4" Closed.